Most canned soups—even the reduced-sodium versions—are very high in sodium. Making your own is a great solution. Homemade soup is a great way to use up fresh vegetables and add a serving of blood pressure friendly foods to your meal. Tomatoes are naturally high in the antioxidant lycopene, which is a carotenoid that could help prevent cancer and cardiovascular disease. 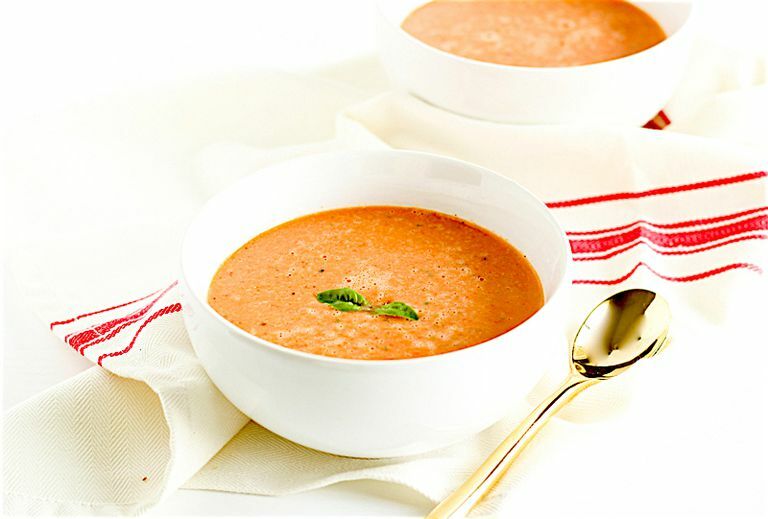 Using fresh summer tomatoes and basil makes this healthy tomato basil soup extra flavorful without the use of salt. Roasted red peppers add a nice subtle sweetness, and milk a little dose of protein. Add a pinch of freshly cracked black pepper and serve with a fresh green salad for a light and healthy lunch. Cut bell pepper in half and remove seeds and stem. Place tomatoes, red pepper, and garlic on the baking sheet and roast 10 minutes. Remove garlic and flip pepper and tomatoes. Return to oven for another 20 minutes. Remove from oven and let vegetables cool. Peel skins from pepper and tomatoes. Add all ingredients to a high-powered blender and blend until smooth. Heat soup to the desired temperature in a saucepan over low heat. Serve with a salad or half a sandwich for a balanced lunch. Reheat leftovers on the stove over low heat. You can also enjoy it cold as a refreshing meal.